Gurtam follows the usual scheme and releases updates on regular basis. Here comes another summer month and a set of new Wialon features! We carefully study your feedback on Gurtam forum and continue to improve our service. 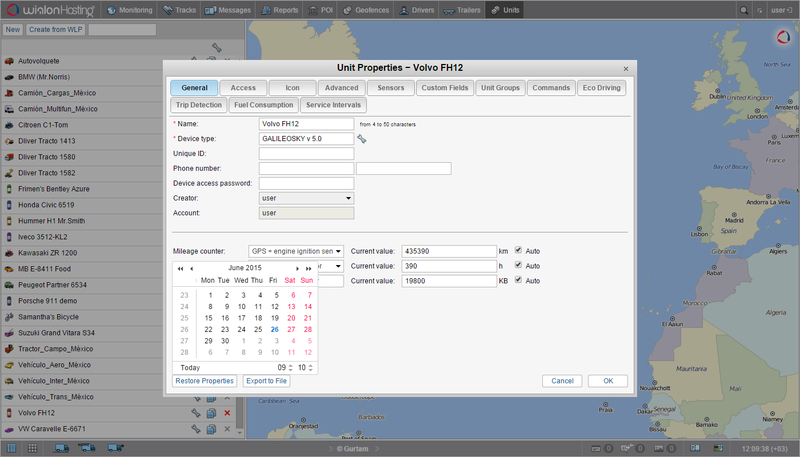 July is marked with a number of new functions added to our cloud-based product. Is it possible to go back to yesterday? Indeed, as long as you have a Wialon Hosting account. We’ve invented a time machine which allows restoring the previous settings. With the new “Restore properties” and “Export to file” functions, you can roll back the changes regardless of the mistakes you make. To restore the necessary settings, you only need to press “Restore properties” button in Unit Properties dialog and choose one of the dates when the settings were correct on the pop-up calendar. The retention period is 30 days. The recovery function is still in its experimental phase, though is already available for a try. Imprudent speeding and braking increase fuel consumption and damage vehicle braking system components immensely. That’s why we’ve added the Harsh driving criterion to the Eco Driving settings. Such a criterion helps to detect speeding before abrupt braking take place (for instance, harsh accelerations and decelerations at traffic lights stops). To determine the driving profile, choose the Harsh driving criterion and set min and max values of g parameter, which is directly related to “abrupt speeding”. For example, If you set g at 0.1 to 0.2, the system will define violations as “moderate”. On the other hand, with min g value more than 0.2 Eco driving will detect only bold dashes performed by a driver. You will find the tool is highly adjustable, for it allows you to take into account vehicle's speed, violation duration and status of selected sensor in harsh driving identification. In Harsh driving settings tab you can also mark min and max speed range at which violation will be recorded. If you need more accurate results, use controllers which measure speeding and braking with the help of accelerometers. The data from speed and location sensors can also be visualized in reports, the accuracy of which, however, needs more attention. We’ve also changed the interface of the Eco driving tab. Now working with it gets more convenient. New functions, with a few of them listed below, have been added to the CMS Manager. At our partners’ request, we’ve added an option to create, adjust and delete billing plans. Now up to 10 billing plans have been enabled. The user accounts can also be sorted by billing plans. Since most operators measure time by months instead of days, you can now set message history storage period in calendar months (or days as in the previous version). 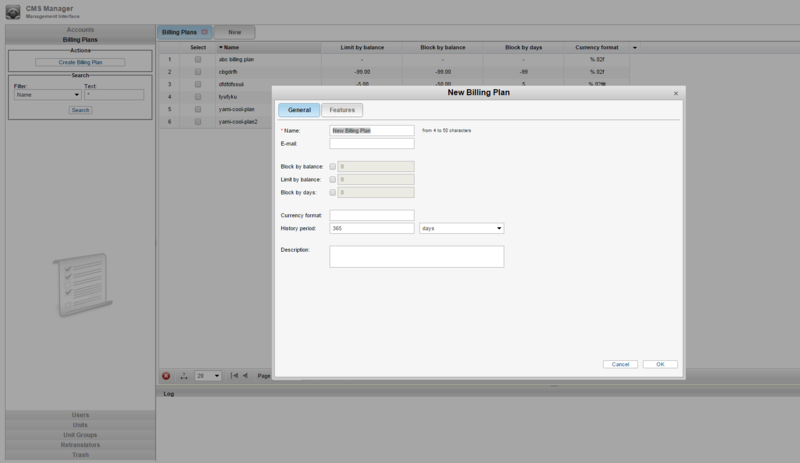 This option is available in CMS Manager in Billing plan properties. For better analyses of the account structure, we’ve added a new option which allows users to receive reports on account hierarchy. The report tab will help you understand what types of elements are contained in a given account and how these elements are subordinate to each other. 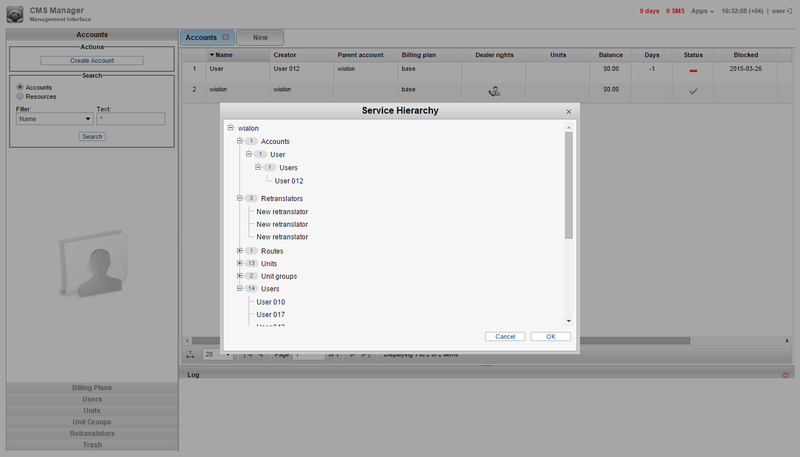 Reports on Service Hierarchy are available in User menu. On Wialon Hosting website you can create account hierarchy reports using Resource report template, where you need to select Account hierarchy in table properties. Accurate positioning and message frequency are among the hottest topics discussed on Gurtam forum. Inaccuracy and attempts to reduce traffic consumption result in clusters of non-visited geofence reports. It happens to public transport stops in cities, for example. To tell one bus stop from another, you have to shrink geofences. In earlier Wialon Hosting versions the visited and non-visited geofences were defined by messages sent within the borders of an established geofence. In other words, if a unit sent messages from the established geofence, the geofence was marked as visited. Now you can detect a visited geofence if it covers a part of your track (with no messages sent on the way). The data will be used in reports on visited and not visited geofences, on trips between them. 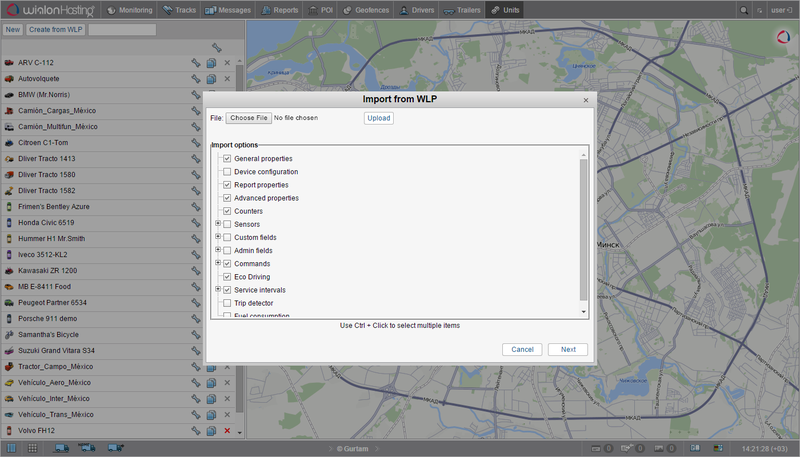 Same function will be available in all other reports as a filter parameter. This function is optional, therefore can be activated anytime. We have simplified the procedure of creating a new unit with preset functions. 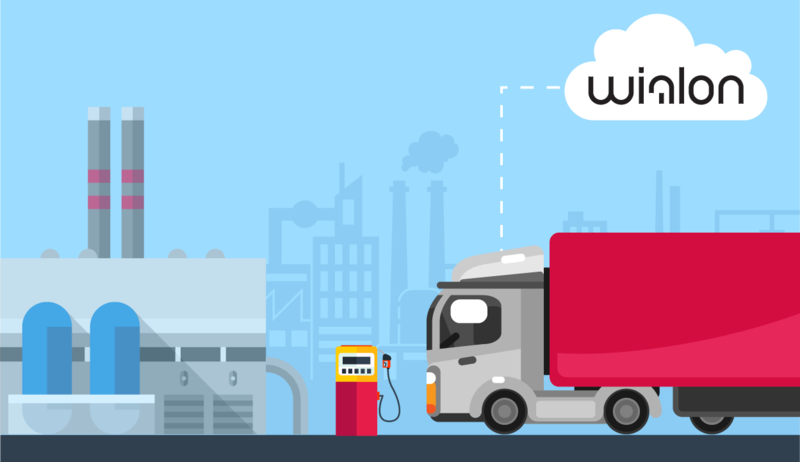 Using Wialon Hosting, you can create a unit from a WPL-file within several clicks. For this purpose we’ve added Create from WPL button. 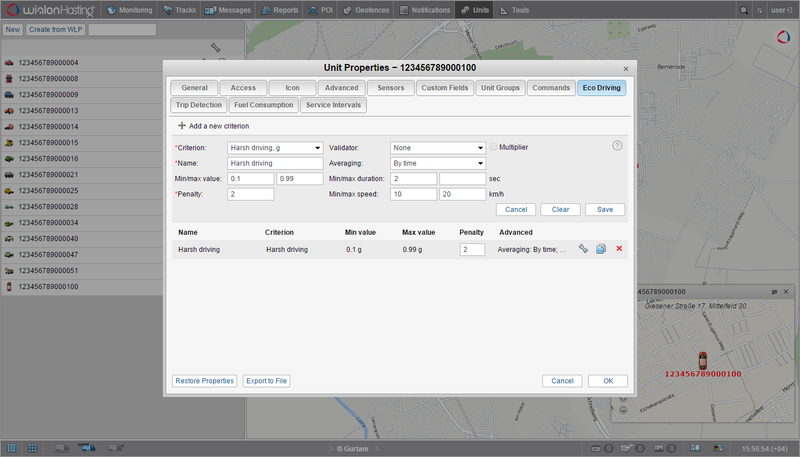 Having uploaded the file, you will see Unit Properties Dialog with the necessary settings. Please note that you cannot import ID and phone number of an existing unit. You also cannot create a unit if the file doesn’t have “Name” and “Device type” fields. We’re still working on Locator app. If you need to provide a link to monitor a unit but still want to hide its track history, you can remove unit’s track from the map by deselecting the corresponding “Tracks” checkbox in Locator’s dialog. If you view reports in Excel or PDF, you can still easily find a physical address on the map since now we’ve added links to the tabs with locations. You can click on a cell containing address, and Google Maps with the corresponding location will open in the browser. For users who often edit reports we’ve integrated an option to remove links. To do so, mark the corresponding checkbox while exporting a report. The List of novelties of the Wialon Hosting is not limited to those presented above. You are free to discover the useful changes and handy functions on your own by staying tuned and helping your customers grow their businesses with us. Have a very fruitful week!